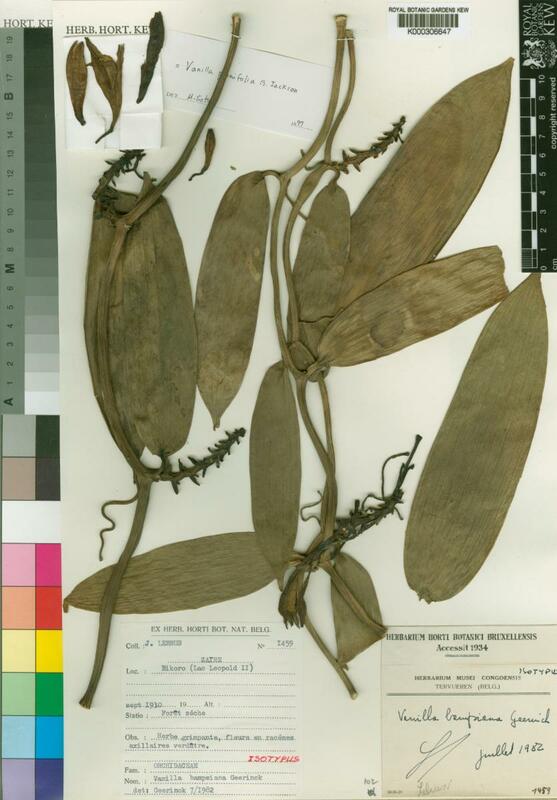 Lianes with aerial or clinging adventitious roots, rooting in the soil where the stem touches the ground. Leaves absent, or if present, sessile to shortly petiolate, fleshy. Inflorescences axillary or terminal, few- to many-flowered. 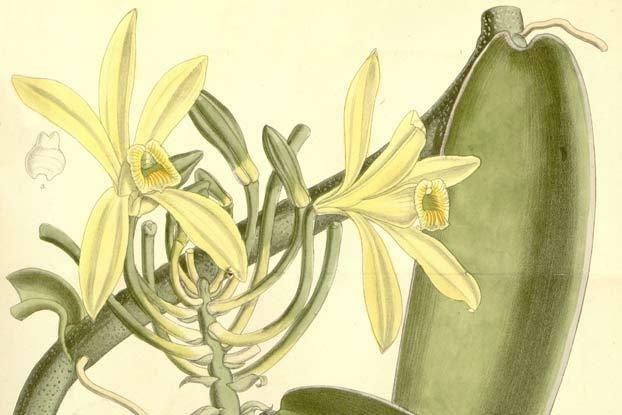 Flowers large; white, yellow or green, often marked with purple or yellow on the lip. Sepals and petals similar, free. Lip usually larger than the sepals and petals, adnate to column for part of its length and forming a funnel; disk variously appendaged with lamellae or hairs. Column elongate, curved, auriculate; anther attached to margin of clinandrium, incumbent, subglobose, operculate; stigma transverse, bifid at the apex, situated under the rostellum. Rostellum broad, membranous, articulated at the base, usually deflexed. 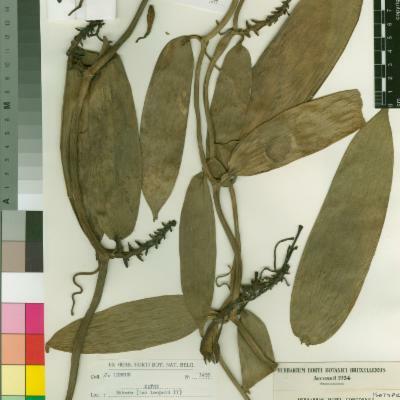 Capsule long, cylindrical, unilocular, dehiscent; seeds black, relatively large. 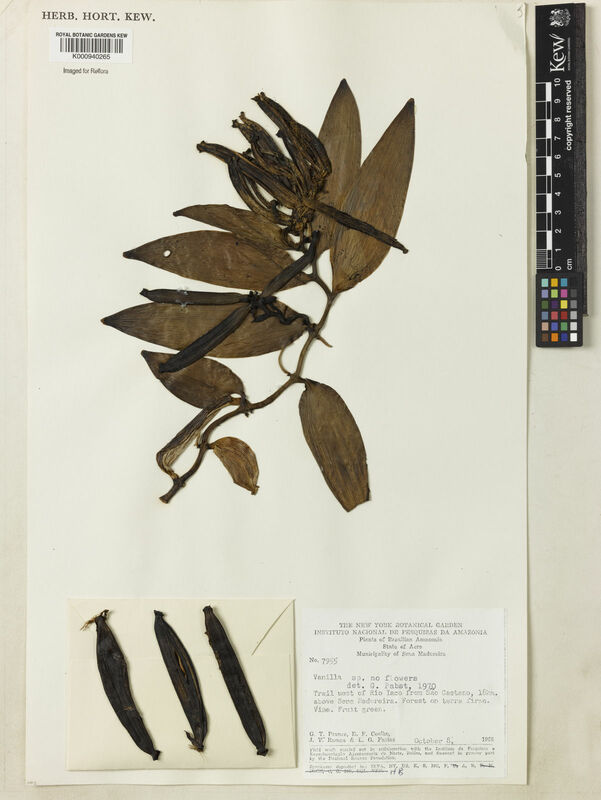 Capsules linear, often very long, unilocular, dehiscent; seeds relatively large, black, shining. Vanilla barrereana Veyret & Szlach. Vanilla bradei Schltr. ex Mansf. Vanilla cucullata Kraenzl. ex J.Braun & K.Schum. 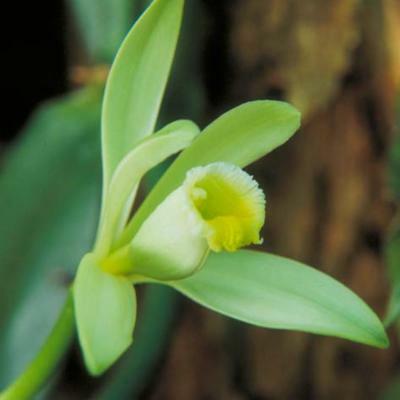 Vanilla karen-christianae Karremans & P.Lehm. 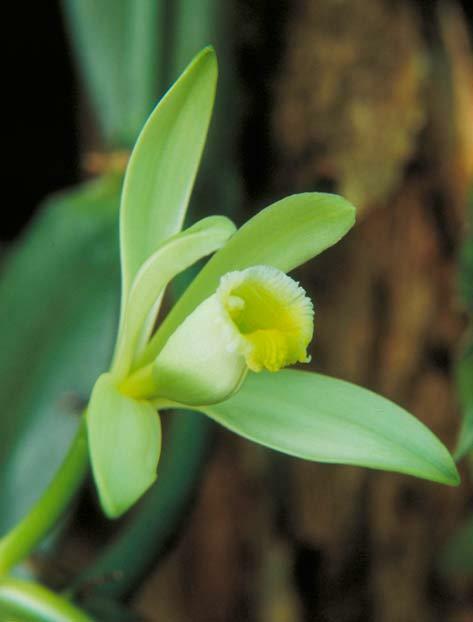 Vanilla labellopapillata A.K.Koch, Fraga, J.U.Santos & Ilk.-Borg. Vanilla methonica Rchb.f. & Warsz. 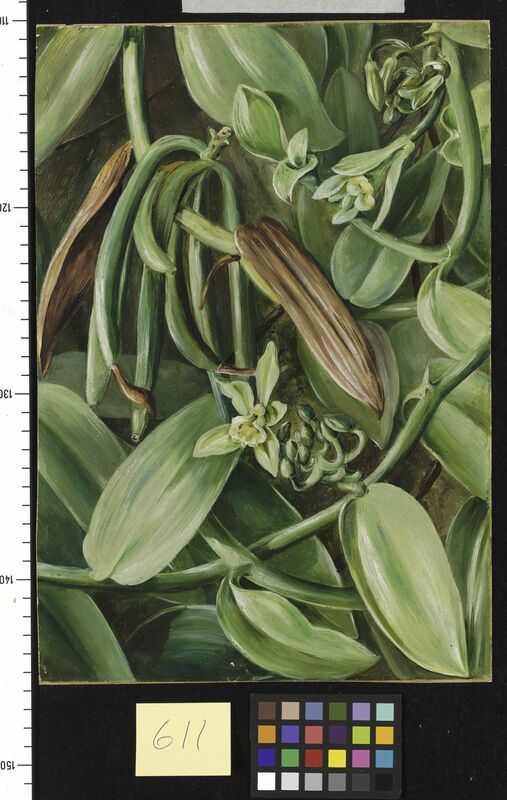 Vanilla palembanica Teijsm. & Binn. 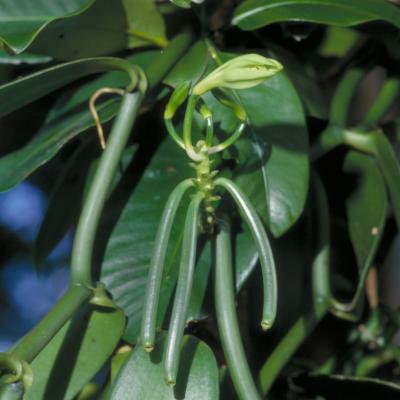 Vanilla palmarum (Salzm. ex Lindl.) Lindl. 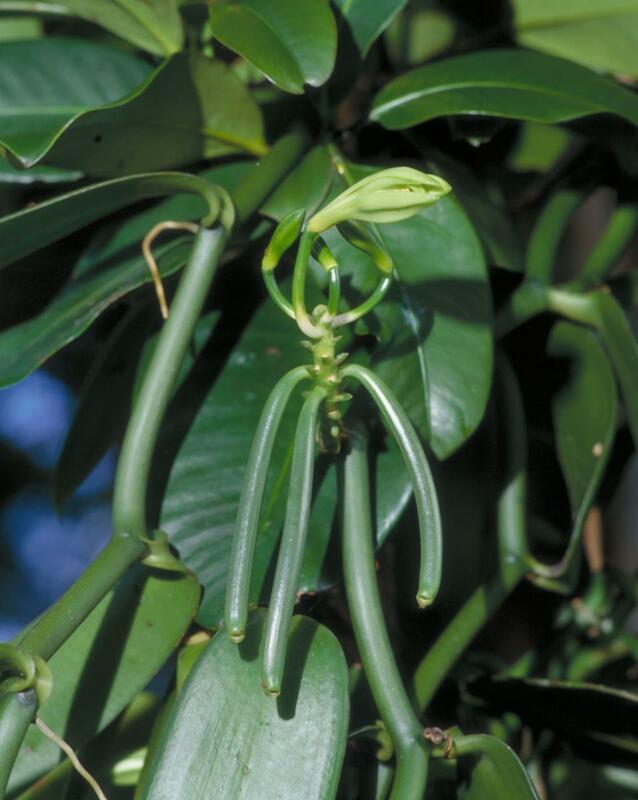 Vanilla penicillata Garay & Dunst. 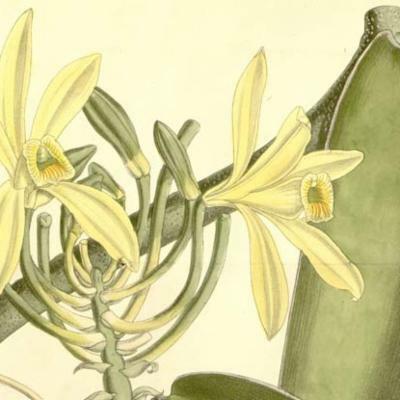 Vanilla sanjappae Rasingam, R.P.Pandey, J.J.Wood & S.K.Srivast. Rolfe in J. Linn. Soc., Bot. 32: 439–478 (1896). Gard. Dict., abr. ed. 4 (1754).